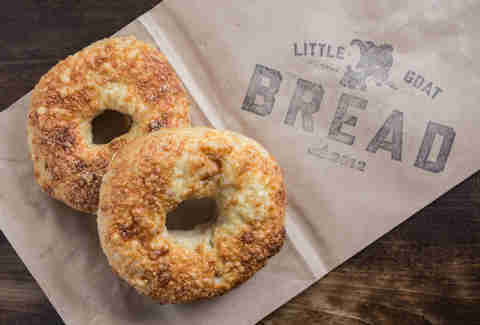 It's no surprise that Top Chef alum Stephanie Izard's bagels score high marks if you've ever tried her line of Little Goat Bread. 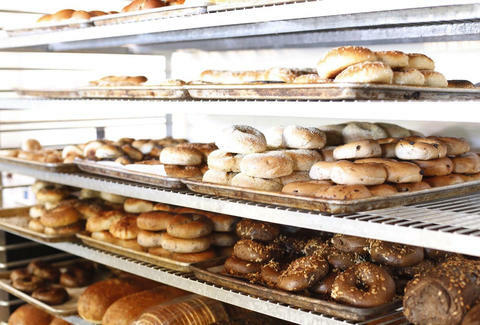 All of her bagels are baked in a steam-injection oven, with different flavors offered daily. Get the Grumpy Goat bagel (a fennel-seed-and-golden-raisin dough ring sprinkled with Wisconsin goat cheese) and feel free to dip it in their cream cheese, which's packed with green beans, cashews, shallots, and fish sauce. With wood-fired bagels, Stumptown coffee, and a laid-back vibe, Reno is even too cool for credit cards (it’s cash-only, but there's an ATM). Go crazy and choose artichoke, whipped feta, or blackberry cream cheese as your schmear. Then come back later for the carnitas and salsa verde pizza. Kaufman’s, a staple on the North Shore for more than 50 years, burned down a couple of years ago, but it re-opened bigger and better, and it’s still packed to the gills almost any time of day. Grab a number ticket (to the right of the door) when you enter, order the just-baked bagels, and be prepared to wait a solid 30 minutes. And yes, it's worth it, especially if you're into lox -- there's a reason this place is an institution. You know it’s gotta be good when your bagel spot serves as a pipeline to other bagel restaurants. 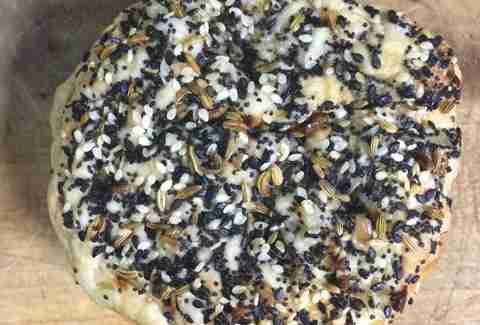 Such is the case for NY Bagel & Bialy, which ships off its deliciousness -- in varieties like garlic, pumpernickel rye, and onion poppyseed -- to Chicago Bagel Authority to make tasty bagel sandwiches. 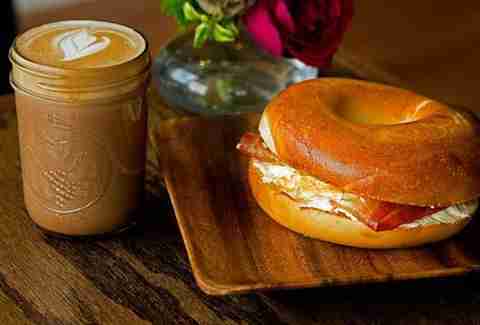 While the bagels are still boiled, a la NYC style, expect this Chicago-style bagel to be a bit sweeter. Try the Bageler sandwich: bacon, egg, and your choice of any of their house-made spreads and sauces, including chipotle mayo or, for those who like ‘em sweet, real maple syrup. Get there at 5:55am when the place opens if you want first dibs at the pumpernickel or blueberry bagels, or raisin stix bialy (Editor's Note: you want first dibs on all of those). 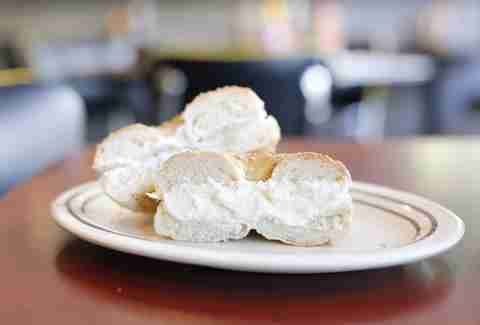 Fill the homemade bagels with walnut raisin or spinach carrot cream cheese spread. A staple on the North Shore since the early '80s, it’s also one of the few places where you can still score a bagel for under a buck. 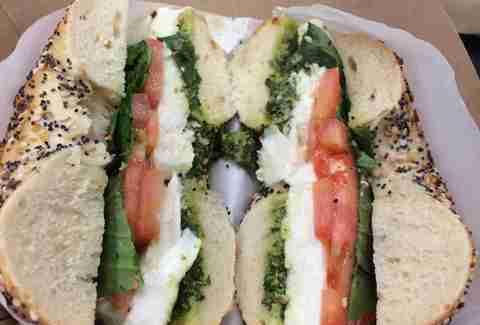 Get yourself an onion bagel with tomato and chive cream cheese at this Kenwood/Hyde Park deli, which is equal parts café, deli, and artisanal grocery store. 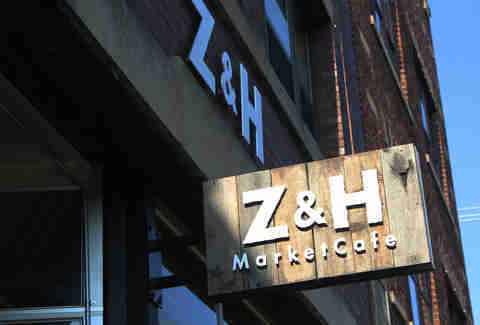 Grab a bagel and leave with bags of oils, vinegars, and hand-crafted breads. Oh right, and more bagels. 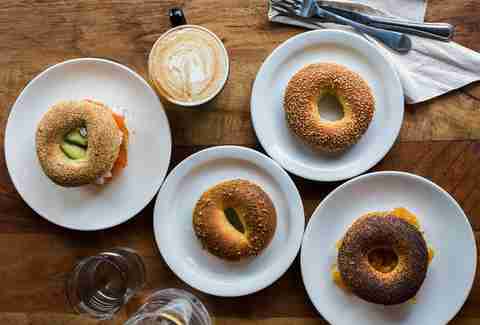 Executive Chef Cleetus Friedman’s bagel lineup is made from scratch every Sunday, the old-fashioned way: boiled and baked. 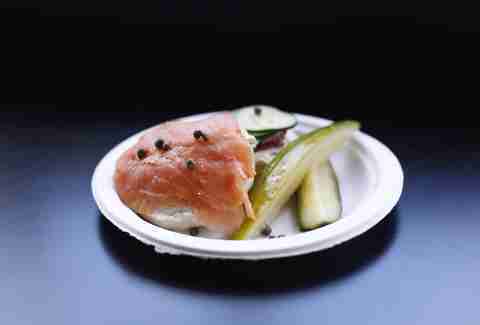 His brunch features a burger on a bagel and bagels & lox platters, while his signature "The Eggel" sandwich pays homage to a defunct bagel place from his childhood (Baltimore's Bagel Shoppe). 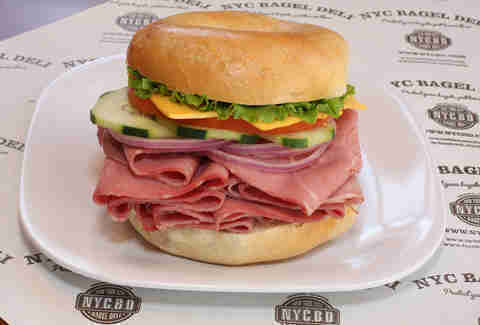 Showing respect to its name, NYC Bagel Deli makes its bagels the real-deal traditional New York way: by first bringing them to a raging boil in an 80-gallon kettle of just hot water. The result: a hard outside, a soft inside, and an actually, truly authentic kettle-boiled bagel. A new addition to the bagel scene, this spot from the owners of Piece Brewery and Pizzeria makes bagels from scratch with spread options like garlic confit, Sriracha, and caramelized onion. And if you don’t feel like waiting for a pizza at neighbor Piece Pizza, opt for the Piece Pizza Bagel (!!!!!! ), which features their signature pizza sauce and, if you want, pepperoni. Megy Karydes is a Chicago-based freelance writer working on a book on female mixologists and feels that every hour should be happy hour. Follow her at @megy.